Thursday afternoon after a doctor’s appointment for NHL and meeting with his providers JL walked out and found a package on the porch.He quickly brought it inside and announced that my package was here. 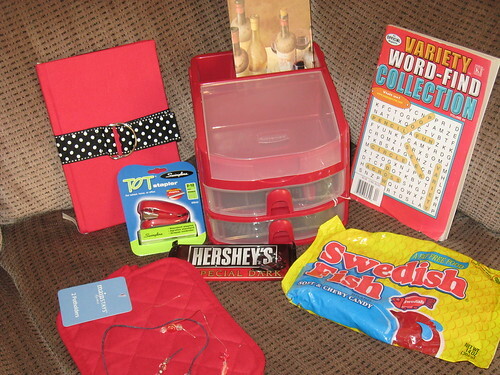 Sure enough my box of goodies from the Shades of Red Swaparooni had arrived from Coolbeansmama. I was floored since she sent it on Tuesday. 1. Red journal with cool polka dot buckle on it. 2. Red tot stapler – something I completely needed since I am always having issues finding the stapler in the house. 3. Word-Find book to do when I need mindless entertainment. These are my favorite to do when I’m just too tired to read and don’t want to watch tv. 4. Sweedish fish – YUMMY! My faorites and if NHL is nice I may share with him. 5. Hershey dark chocolate bar – something for JL to make him happy. 6. Amazing Rubbermaid organizer. My plan is to put this in the kitchen to hold my supplies to keep them easy to locate and safe from the boys. 7. Bright new pot holders, something that we are always in need of for baking things. Coolbeansmama did a wonderful job selecting items for me. Hopefully her package from moi will arrive soon. Once she gets it I will post photos of the items I sent to her. Thanks again Coolbeansmama for everything! Great swap gifts!! You know what I did?!? I got my package and was so bust forgot to take any pictures!! Now everything is put away so I will just have to write what all I got. Duh to me! Sandra: Yes, Coolbeansmama did a great job with the goodies. LOL – Ooops on not taking a photo. You should ask your swap buddy if she took photos of the things before she sent them to you. I know I took photos of mine before they went out. If she has them she can post the photo to the Swaparooni group.